Salisbury, North Carolina Real Estate: Beautifully Updated Brick Home with HUGE Full Basement - For Sale! Beautifully Updated Brick Home with HUGE Full Basement - For Sale! This handsome blond brick and stone ranch-style home with a full basement has a lot to offer! 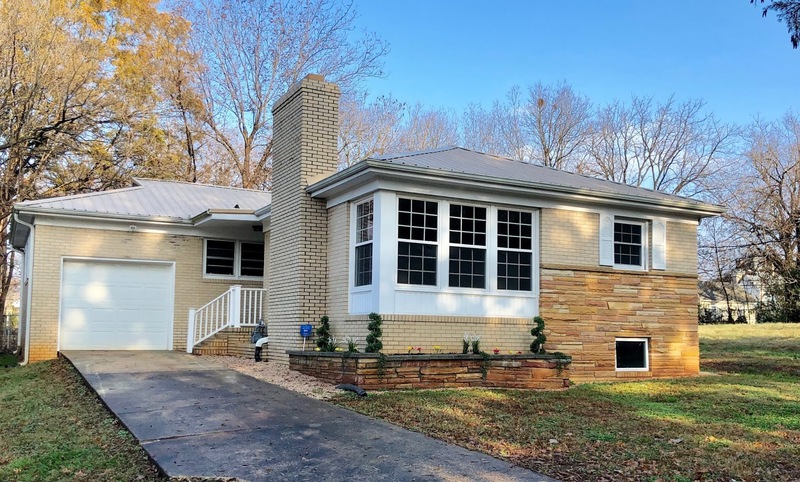 Let Realtor Greg Rapp welcome you to 1020 W. Monroe Street in Salisbury, North Carolina, just outside the Livingstone College National Historic District and across the street from the historic Livingstone College campus. (704) 213-6846 gets you your private showing today! But in the meantime ~ listen to this! Clean lines with a post-Modern feel describes this attractive single-story 3-bedroom home, with its fresh and open floor plan. While built in the post-Modern era (1959), the interior has been beautifully updated with a stunning newly installed kitchen: from floors to cabinetry to countertops to handsome black and pewter appliances ~ all new! The pretty grey-toned laminate floors set the modern mood, and a newly installed half bath residing just off the kitchen is the finishing touch. A side door to the kitchen makes unloading groceries a breeze! The spacious living room with fireplace connects to an open dining room area that in turn leads back to the kitchen. Gorgeous large windows stream natural light onto hardwood floors. The hall bath boasts its pretty original ceramic wall tiles and tile mosaic floor in calming shades of green. But wait . . . there is more! The upstairs is a full 1290 square feet . . . but take the staircase to the basement and your jaw will drop at the 1290 MORE square feet below. This newly refinished, spotless and dry full basement has its own separate walk-out entrance, and its own utilitarian full bath. This lower level is all one spacious room with a fireplace and lots of windows for natural light. Here, you will have no trouble envisioning the potential to convert this level to living space! 1020 W. Monroe Street has been freshly painted throughout the interior and has a good number of updated replacement windows, and a newer roof. The current owner plans to install a new furnace in the very near future. Add all this to the improvements made in the basement, the new kitchen and half-bath, and the brick and stone exterior with pretty white shutter trim . . . and you are looking at low maintenance for years to come! This 2,580 square foot home sits on a 200' deep, partially fenced lot with some mature trees providing shade from summer heat. An attractive stone flower box spans the front facade of the home, greeting you as you drive up the concrete drive toward the single-car garage (the garage also has a rear access car door!). Come up the brick steps and into the front door (hint: this house has the BEST doorbell! ), and get ready to call this home-sweet-home. Come take a look at all this fantastic house at 1020 W. Monroe Street has to offer ~ and make this house your home. Give Realtor Greg Rapp a call to see this home for yourself: (704) 213-6846.